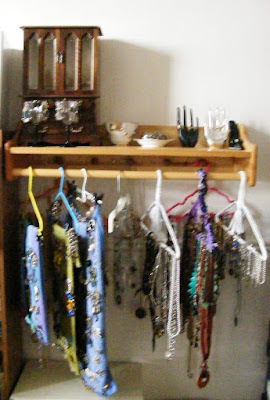 Well, I don't actually have a jewellery box. That is to say I have several, but nothing that comes close to holding all my swag. Like my sewing stash, my jewellery collection has come to me from several female relatives; mostly from my Aunt Rita who must have been one of Oklahoma's reigning queens of maximalism. Lest you think I'm bragging, I hasten to add that 99% of it is costume. And probably 80% doesn't particularly suit me. But where's the fun without a challenge? - Let's Do Data Analysis! So, I thought it about time I played Wear All My Jewellery. This is no mean feat given the sheer volume of the stuff. 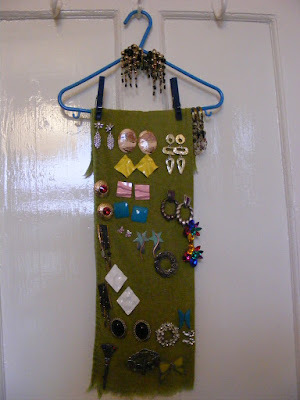 I could open a Vintage Jewellery Shoppe, specialising in the 1980s over-sized earrings. 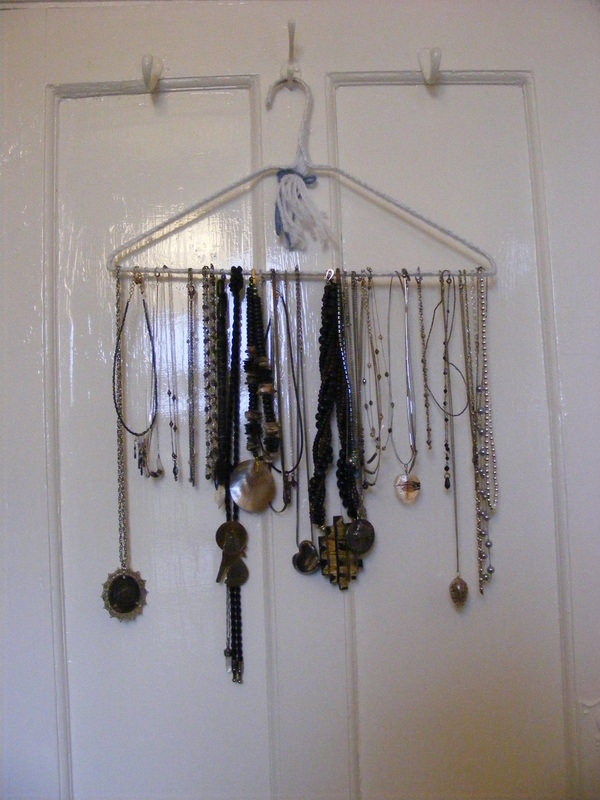 Having tons of jewellery (I paid for excess baggage weight on the trip home, in spite of filling three mens' carry on luggage) means I've needed to use some imagination to store it a way that lets me see what I have. Strangely, once I did that, I sort of lost interest. I'd forgotten about this shelf Bill put up for me. 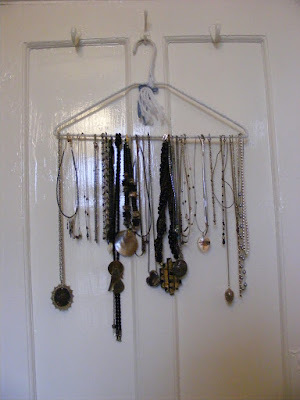 I was frightened to hang too much for fear of ripping it off the wall. Forgive the terrible photos, I took them back in 2011, not that the date is any excuse. So, for my 2018 game I've started with brooches, many of which are pinned to a crocheted belt, another item I inherited from Rita (Jack said, take anything you want, it's all going to a charity shop, or something similar; I filled my suitcases and then some. Grief makes us do funny things). Anyhow, the game for these goes 'top to bottom' as for which comes next. Probably most of these are ones I've worn in the last year or so. There are plenty of others somewhere. I loved brooches when I wore suits, back in the Dark Ages. They were part of my 'signature'. I still like them, but they are hard on knitted garments (they weren't very nice to my closely woven jacket lapels, now I think of it). I read a tip about having a square make-up sponge on the inside of a blouse or sweater will help take the weight off the fabric. I don't own one, but have folded up some fabric bits into a similar size and this seems to be working OK. I'm also thinking that some steel wool might help sharpen some of the pins a bit as well. Monday night I wore a red-eyed leopard on my red jumper to our Book Group meeting, but it was my secret as the pub was so chilly my coat never came off. The day before, my brooch had an oval - possibly abalone - stone of bright blues framed in a pewter coloured metal in a delicate filigree. I chose a long sleeved blue tee shirt (it happened to be the first on the left, but the rule for this game is the first thing of the right colour starting at the left). A grey vest (tank top) went underneath for warmth. Black and cream plaid trousers, a black wool cardigan and black shoes completed my outfit. I never left the house, but that is entirely beside the point. The main point - just to be clear - is that as long as I'm wearing each thing I own it is unlikely I will get bored with what I have. I don't guarantee never to buy any more jewellery, but at least I'll be very clear about what gap it is filling. boxes and one tea towel hold the rest of the earrings. Today I'm wearing a green-eyed leopard with taupe jeans and long sleeved tee and a cream coloured wool cardigan. The green pieces will be the hardest as I don't have any green in my wardrobe, but one day I may rectify that if I find the right green. 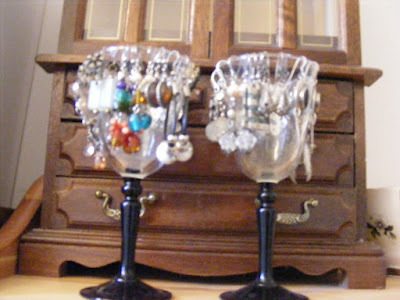 Three brooches have not made the cull: two because they have missing stones and one because it isn't at all 'me'. It is a hand crafted piece that is very clever, made by one of my craftiest friends. I appreciated the thought, but felt silly wearing it. It went in a charity bag (along with most of Bill's ties) and I'm hoping someone else will love it. The two with missing stones have gone into a small wooden chest, one of several my Mom had from the 1930s or 40s. I have a plan for that chest...but that is another post. As games go, I realise this isn't particularly exciting. Then again, I have been told I'm easily pleased. I'm pretty sure it wasn't intended as such, but I took it as a big complement.